By Lassie, December 24, 2006 in INTRODUCE YOURSELF! 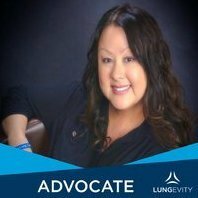 Hello, my name is Valerie and I have lung cancer! It has taken me two years to say those two words aloud! The shame, the guilt and the remorse are for posts at another time. I am just proud I have finally said those two words. Two years ago today I found you all. I am a gift shop owner who was in the Christmas frenzy working. I closed early Christmas Eve of 2004 so the staff could go early to their families. I then collasped in front of my computer to research info on lung cancer as I was sure I was succumbing to it. Everything I read was so doom and gloom. I happened upon this site and read a few posts and decided right then that what ever happens I have a place to go and that it all would be okay. Prior to becoming a business owner, I spent many years nursing and supervised at local hospitals. I also became the nursing consultant for my province. I was a closet smoker. During the spring and early summer of 2004, I felt myself slow down and was becoming short winded so I finally quit smoking with the help of Nicorette gum. It seems thereafter things went downhill, I developed a cough and then hoarseness. By November I was so ill and each and every day became harder to get through. I was too embarrased and ashamed to see my doctor that never knew I had smoked. I think I just figured if I kept going and denied it all, it would go away. It didn't. I did not want to ruin the holidays for my family so I held off and finally went to out patients on Dec 29, 2004 with a collasped lung, inability to breathe and in great discomfort. The look on the OPD doctor's face upon reading my X-rays was enough to know my fears were in order. By the time, I went through the further tests, the surgeon told me the primary tumor was inoperable and I had only 3- 6 weeks to live without treatment and with treatment my prognosis was bleek. Then the oncologist felt perhaps 3 - 6 months with treatment if I responded very fast as my pulmonary artery was just about totally blocked. It is Christmas Eve, 2006, I am still here and so are you folks. Even though we have not met personally in here, each and every one of you that posted, unknowingly reached out, held my hand and walked by my side during my journey. Some of the people I have followed in here are now gone or have lost their loved ones, however they remain in my heart. Well, most of the time, when someone introduces themselves here, I tell them sorry they ended up here...but for you posting now two years later...well to you I say welcome and job well done. What can I say....better late than never. It's great to meet you. So glad we've been able to be a help and hopfully will continue to be. Again better late than never. I am so glad you did find this site - when I was first dx'd I had that same doom and gloom prognosis. I'm happy to say that the Hospice that was caring for me asked me to leave.. ( my kids say I'm not dying fast enough ) I was dx'd 5/2005 and happy to say I just celebrated my 57th birthday- thay said I wouldn't make it to 56 !! I'm not cured by any means - but because of these wonderful people on this site I HAVE HOPE. They're always with me . Good and Bad times. So welcome again - have a very MERRY CHRISTMAS, and if I can EVER be of any help just hollar. Welcome BACK!! I'm so happy to read that you are doing well. My hopes continue for you!! Have a wonderful holiday!!!!!!!! Thanks for coming back to inspire us all!! Well it took awhile but I am glad you posted and told us about you. It is good to know you are doing well. I hope you will not be a stranger and post often-- our members with SCLC need to see others that are surviving. Merry Chirstmas Valerie. My cancer has been chipping away at me for 3 years but I am still here too. It is good to see you post. Hey Valerie, I'm still here too They can't get rid of us, can they? Valerie,welcome to our support family.There are many here to help you along the way.Congratulations on being a survivor this long already and ai am very glad you are doing well. Welcome to this loving and caring support group for lung cancer survivors,their loved ones, and caretakers. You have come to a wonderful place where you can talk about anything concerning your worries about lung cancer, treatment, or just vent about your worries, etc. You need to rid yourself of the notion that you brought this on yourself by smoking. That is not the case, and even if it was, nobody deserves this savage beast lung cancer. There are many, many people who have never smoked in their life or been around smoke that end up with lung cancer. There is no really proven theory that lung cancer of itself causes cancer. A very large percentage of smokers NEVER get lung cancer; and many who do. Don't beat up on yourself about this. Hello Valerie and so glad you posted! You brought some light to my day and I truly am enjoying the Christmas holiday with much more hope in my heart. Tony has been at this for 21 months now and HE'S STILL HERE TOO! Thanks for pointing out the obvious that I tend to forget everyday that he is with me. You say you've received a lot of hope and encouragement from this site. Well, I just received a TON of it from your post. THANK YOU. Wishing you a happy healthy 2007! Hi Valerie and welcome. I'm glad you have joined us and let me say congratulations! Go ahead and put that shame, regret and remorse in your back pocket as we all have learned that life is too short to dwell on the past. Welcome to this wonderful site Valerie. You will find much support here. Thank you for posting....... as someone that is only 6 months from diagnosis and first an operable IIIA and the Dr.'s telling me 20-40 years and then going to stage IV with brain mets and the Dr.'s telling me that getting me to five years is going to be very important.......your post means the world to me. First off, congrats on your two years. Goes to show you how doctors can be wrong. I love when someone beats the odds. It certainly helps our newcomers to know NOT to listen to stasticts. You are living proof of that!!! Now secondly, I am so glad you came out of the closet (here) and posted. It makes us feel good to know that there are people out there that are helped by our posts that we don't even know. And when they come one here to tell us that it is so special. I hope others follow your example and lets us know this. Also we can't give support or prayers if we don't know you exist. Welcome Val, I hope you stay and help us answers questions and to give support to our newbies. I just read your profile and I have to say that's quite a story. You've been through a lot and I'm glad to see you're recovering and healthy. Your determination to stay alive is admirable and an inspiration to me. Keep staying well. Great big thank you's to everyone for lovely warm greetings! I think when I was first diagnosed I was too scared and did not want people to know it, then I got very angry and did not wish to post while in that state, etc....as I worked through the emotional impact of lung cancer. I am so glad I am finally in a place that I can talk about it. There are so many who are going through the lung cancer process. I just want to reach out and embrace them all and let them know, we are here for them just as you all were for me. Thank you Folks, thank you very much! Great Post!!! I thank you so much. Talk about giving hope - it can't get any more hopeful than this. You go girl! I'm rooting for you all the way and hope my beloved Mum experiences the same miracle. Unbelievable - what a story! Thanks so much and here's to a happy, healthy 2007! Hey Valerie, Welcome from one Canuck to another! It's great to see you are making liars out of your doctors.